In The Cancer Journals Audre Lorde wrote, ‘I do not wish my anger and pain and fear about cancer to fossilise into yet another silence, not to rob me of whatever strength can lie at the core of this experience, openly acknowledged and examined.’ Founded on this same principle, The Following Scan Will Last Five Minutes was written in the three months following Dutch writer Lieke Marsman’s cancer diagnosis. 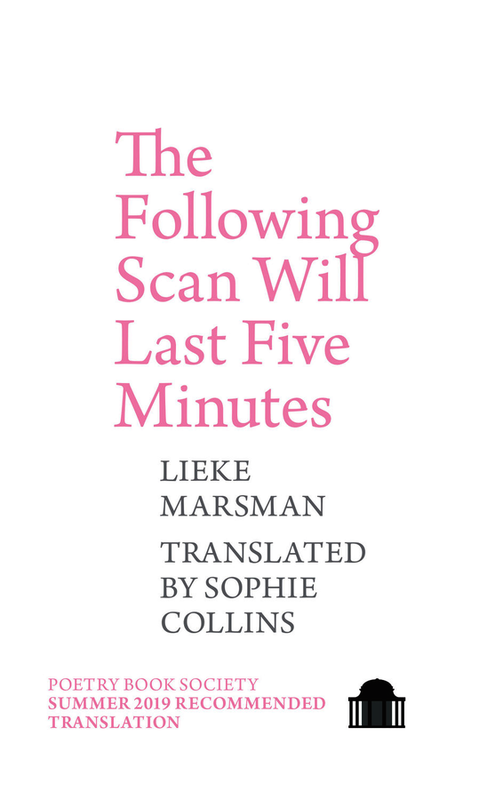 A series of short poems anchored by an essay that speaks directly to Lorde’s journal entries and personal reflections on cancer, Marsman considers, among other things, the state of contemporary Dutch politics and – via Susan Sontag’s Illness as Metaphor – the rhetoric surrounding her disease. A work of poetry, social criticism and autobiography, The Following Scan is an honest and dryly comic account of a period in the author’s life that elides pretension in search of autonomy and self-knowledge. Beautifully translated by the poet Sophie Collins, the book also includes a translator’s note in the form of a letter to her author and friend. Lieke Marsman is the author of two books of poetry, Wat ik mijzelf graag voorhoud (Things I Tell Myself) and De eerste letter (The First Letter), for which she has received several awards, including the C. Buddingh’ Award and the Van der Hoogt Prize. Her first novel, Het tegenovergestelde van een mens (The Opposite of a Person), which incorporates poetry and non-fiction to address questions of climate change and loneliness, was published in 2017 by Atlas Contact. Sophie Collins grew up in Bergen, North Holland, and now lives in Edinburgh. 'small white monkeys', a text on self-expression, self-help and shame, was published by Book Works in 2017 as part of a commissioned residency at Glasgow Women’s Library. Her first collection of poems 'Who Is Mary Sue?' was published by Faber & Faber in 2018.